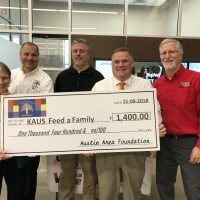 The Feed A Family program received a donation from the Austin Area Foundation on Thursday to help this year’s fundraising effort. For the 11th year, Feed A Family will put together holiday meals for families in need this holiday season. Each meal consists of a Hormel ham, two cans of vegetables, Mrs. Gerry’s Mashed Potatoes and Cranberry Salad, Buns from Bimbo Bakeries, a pound of butter from the Mower County Dairy Association, a pie and whipped cream. Families in need can request a holiday meal through an application process administered by the Austin Salvation Army. 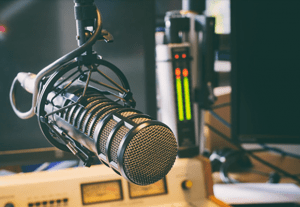 Jeff Baldus, Executive Director of the Austin Area Foundation stated that contributing to Feed A Family is a perfect fit with the mission of the Austin Area Foundation which is improving the lives of people in the Austin Area. Anyone can contribute to Feed A Family by stopping at Hy Vee in Austin and letting their cashier know that they would like to ‘feed a family’.